A young English biographer is working on a book about the late writer, John Coetzee. He plans to focus on the years from 1972 - 1977 when Coetzee, in his thirties, is sharing a run-down cottage in the suburbs of Cape Town with his widowed father. This, the biographer senses, is the period when he was finding his feet as a writer. Never having met Coetzee, he embarks on a series of interviews with people who were important to him - a married woman with whom he had an affair, his favourite cousin Margot, a Brazilian dancer whose daughter had English lessons with him, former friends and colleagues. From their testimony emerges a portrait of the young Coetzee as an awkward, bookish individual with little talent for opening himself to others. Within the family he is regarded as an outsider, someone who tried to flee the tribe and has now returned, chastened. His insistence on doing manual work, his long hair and beard, rumours that he writes poetry evoke nothing but suspicion in the South Africa of the time. Sometimes heartbreaking, often very funny, SUMMERTIME shows us a great writer as he limbers up for his task. David Grylls in "The Sunday Times": "Ostensibly, Coetzee projects himself as a marginal, maladroit figure, a failure in love and literature. But is this really unsparing self-dissection or a sophisticated exercise in self-approval? In Summertime he has in effect drafted his own obituary. Perhaps his next book will come equipped with its own reviews -- all ghosted, in suitably downbeat mode, by JM Coetzee." James Ley in "Australian Book Review": "The novel's use of multiple perspectives often makes John seem distant, almost a secondary figure in his own book, as the personalities of the various interviewees assert themselves, but it also functions as a way to voice -- indeed, to overtsate -- every imaginable self-doubt and criticism in a blunt and objective manner. Summertime uses this scourging negativity in the way that Thomas Bernhard's novels use anger: it becomes the book's driving force, the source of its intellectual and creative energy." Michela Wrong in "The Spectator": "Two previous volumes -- Boyhood and Youth -- recounted the author's childhood in the Western Cape as the son of middle-class Afrikaners and his move to London, where he tried his hand as a computer programmer. Like Summertime, both of those books used the distancing third person, as though Coetzee simply could not bear the intimacy of a life conveyed first-hand. In this volume he goes one step further along the path of self-elimination, viewing his experience exclusively via the insights of outsiders, almost all of them women...One admires the art. The writer's ironic detachment, his playful tweaking of narrative conventions and readers' expectations, causes a wry curl of the lip. But at the end the reader is left hungering for some form of resolution, an end to this game of bluff and double-bluff." Boyd Tonkin in "The Independent": "Summertime extends a chain of fictionalised memoirs that began with Coetzee's Boyhood (subtitled, as here, 'scenes from provincial life') and continued in Youth. Yet it also returns to the ironic, self-mocking -- and always deniable -- dramatisation of a parallel life that he recently undertook in Diary of a Bad Year...Of course, Summertime is fiction above all -- 'auto-fiction', if you prefer. All the same, it dwells on a time and place where manipulated versions of character and identity could dictate not merely the difference between success and failure, acceptance and rejection, but even life and death. It matters decisively who tells an individual's story -- and how they opt to tell it...The book will easily wrongfoot any naïve seeker of correspondences between art and life. That is part of its point -- but so too is the tender and incisive portrayal of thwarted feelings in a time of troubles, and the robustly drawn women who give this anaemic anti-hero lessons in a tougher kind of truth." Geordie Williamson in "The Australian": "Summertime might well be read as a literal rendering of the author's dictum from his early critical work, White Writing: 'Our craft is all in reading the other: gaps, inverses, undersides; the veiled, the dark, the buried, feminine; alterities. '...Indeed alterity, the philosophical principle of exchanging one's perspective for that of another, is what drags Summertime out of the mire of subjectivity and self-loathing that sometimes bogged Boyhood and Youth...This rather dry, theoretical reading does not do Summertime full justice, however. The book is richer and more vivid than that. Like Philip Larkin, whose poem Posterity is written from the posthumous viewpoint of a creative artist imagining his biographer at work, and who takes the opportunity to mockingly construct his own epitaph, Coetzee's death frees him from the old constraints. Not only does Coetzee dose himself with self-ridicule, he also permits his self-construction some naked displays of emotion." Peter Craven in "The Age": "It's a very odd, brilliantly executed book that might come across as doodlingly narcissistic if we did not know that it was the work of the notably retiring and austere writer, J. M. Coetzee. If we didn't know that, then the tenor of the book, the glow of puzzled expectation that we bring to it, would be different...The last part of the book is made up of extracts from his journal entries focused on his ageing and ailing father, who appears intermittently in the preceding pages as a frail and constricting figure. The account of the father has, in a way nothing else in this book does, an overwhelming poignancy...It is as if Coetzee has finally let himself go, the one moment in this book that has the unmistakable authority of the signature of the great novelist, J. M. Coetzee, is in this portrait of the frail figure who did and who didn't dominate his life and who allows him, by some untoward principle of impersonality, his self-defining moment." Thomas Jones in "The Observer": "Summertime plays with the question, which Coetzee seems to find genuinely baffling as well as wryly amusing, of why people should be at all interested in him as a human being...A novel so flagrantly autobiographical as Summertime appears to test that assumption to its limits. 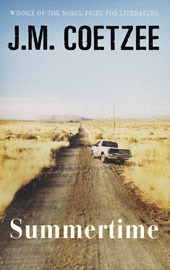 But then again, considering that Coetzee has changed the most basic fact of his life -- whether he is alive or dead -- for the purposes of the novel, readers have no grounds for believing that anything else they are told about the character John Coetzee necessarily holds true for his eponymous creator." James Urquhart in "The Independent on Sunday": "Billed as the third instalment of a trilogy of fictionalised memoir begun with Boyhood, these 'scenes from provincial life' are evocative rather than literal, the impressionistic testimonies forming a stylised work far removed from the conventional nuts and bolts of a curated life. JM Coetzee flourishes within this ambiguous literary distancing, which he used to great effect in his last novel, Diary of a Bad Year, whose subject was also a crotchety old writer and Coetzee cipher...How far the reader wants to map the somewhat wintry lament of Summertime back on to JM Coetzee's life depends on how far one is willing to extrapolate plausible fact from nuanced, many-layered fiction. What Summertime offers is a subtle, allusive meditation: an intriguing map of a weak character's constricted heart struggling against the undertow of suspicion within South Africa's claustrophobic, unpoetic, overtly macho society." You can read an extract from the book published in "The New York Review of Books". This page contains a single entry by Perry Middlemiss published on September 10, 2009 9:30 AM. 2009 Queensland Premier's Literary Awards Winners was the previous entry in this blog. Of Helen Garner and J.M. Coetzee is the next entry in this blog.